It's often said that veterans are individuals who wrote blanks checks to the United States for an amount up to and including their lives. Despite the gifts they freely offered, many American veterans died without ever having received acknowledgment of and attention to their unique needs at the end of life. Little more than a dozen years ago, few hospitals, including the Veterans Health Administration medical centers, had palliative care teams, and, because they were not routinely referred to community hospices for end-of-life care, many veterans died in acute care settings without the benefit of specialized, compassionate care or support for their families' needs, cornerstones of hospice care. In recent years, however, the VA has made remarkable strides in honoring and caring for dying veterans. According to J. Scott Janssen, MSW, LCSW, a clinical social worker with the Hospice and Palliative Care Center of Alamance-Caswell in Burlington, NC, it's been a complete transformation. "Now, VA referrals are common, and it's not seen as a transfer of care, but rather as a blending of the skills and resources of both systems into a larger care team focused on helping a veteran stay home and supporting families as they provide care." This transformation has been made possible by numerous VA initiatives and partnerships that have broadened access to palliative and hospice care, improved the quality of that care through the use of best practices, and fostered a culture of collaboration that ensures that all who contribute to caring for veterans at the end of life are knowledgeable about resources, educated about veterans' special needs, and committed to sharing their expertise. Perhaps best exemplifying this progressive strategy and the most outstanding of the VA's efforts is collaboration with the National Hospice and Palliative Care Organization (NHPCO) that resulted in the creation of the We Honor Veterans program. The American Hospital Association recognized this highly successful campaign with its Citation of Honor for creating and expanding an infrastructure that has made it possible for 100% of all VA medical centers to have interdisciplinary palliative care teams and to extend their reach by partnering with community-based providers. Approximately 10 to 15 years ago, says Jennifer Palumbo, LCSW, hospice and palliative care coordinator at Charles George VA Medical Center in Asheville, NC, the VA tallied the growing numbers of World War II veterans who were nearing end of life and acknowledged both its inability to adequately support the nation's veterans in their ultimate time of need and the looming rise in the numbers of men and women who would need care as the Korea- and Vietnam-era veterans age. Already, approximately 22 million Americans are veterans, and 1,800 veterans die each day. According to Scott T. Shreve, DO, national director of the Hospice and Palliative Care Program at the VA, speaking at a March 2015 Institute of Medicine National Action Conference on "Policies and Payment Systems to Improve End-of-Life Care," 97% of veterans will die outside of the VA system. Since the solutions couldn't come from the VA alone, he said, the focus would have to be on partnerships with community resources. So began a quest, Palumbo says, to bring hospice and palliative care to all VA medical centers and, over time, to make it available beyond these centers as well. "The VA was able to obtain funding from Congress, and each VA facility had the opportunity to submit for grant funding to establish an inpatient hospital unit if it did not already have one." At the same time that Palumbo and a colleague submitted a grant proposal and secured funding to staff a new hospice unit, the VA established funding for each facility to have a fully interdisciplinary palliative care team. Now, all veterans have covered access to comprehensive hospice and palliative care services, whether at one of the 152 VA medical centers, at community health centers, or at home. As the VA acknowledged the limitations in its ability to care for all veterans at the end of life, it reached out to the National Hospice and Palliative Care Organization (NHPCO) to see how together they could improve care, says Gwynn B. Sullivan, RN, MSN, senior director of access at the NHPCO. It was clear, she says, that no one organization or entity had the capacity to meet the needs of the growing number of veterans, and that the solution would have to be reached through partnership and collaboration. This kick-started a series of joint efforts that began with a needs assessment and a testing of strategies to meet those needs. Once best practices were established, We Honor Veterans was launched with the goal of using those practices to provide seamless care at the end of life to all who served. Sullivan says that the VA and the NHPCO are celebrating the fifth anniversary of the program. Today, she says, about 3,800 organizations are actively involved in the campaign, including 2,794 hospices that have signed on, along with other community health care providers such as assisted living and long term care facilities, home health agencies, and even funeral homes. "We know that the majority of veterans receive care from community agencies," Palumbo says, so this collaborative program between the VA and hospice agencies extends the reach of care, "providing veteran-centric care" wherever it's needed. "The funding that went into all these programs gave us a fluid system so veterans could receive care at the VA or at home, depending on their preferences," Palumbo says. Sometimes, she adds, veterans may wish to be at home, but they may not have caregivers or their needs may exceed that which can be provided at home, so the accessibility to inpatient hospice bridges the gap. These efforts have demonstrated that when hospice is available, veterans will use it. Palumbo points out that the VA itself doesn't provide home hospice care, but it contracts out to community resources that are available in every county so that all veterans can receive home hospice care. And further, she says, if there are needs the community agencies cannot meet, the VA collaborates with additional providers to provide necessary equipment or services and make itself available for collaboration and support. And while veterans receive community hospice care at home, they're still able to avail themselves of all the services provided at any VA medical center. Thus, through these initiatives, veterans' preferences are honored and their needs accommodated in the manner they choose. "It's gone beautifully," Palumbo says. Central to We Honor Veterans' effectiveness is the concept of best practices. The program, Palumbo explains, has very specific guidelines and levels of care that agencies can try to achieve. The agencies can take part in a tiered recognition program, gaining increased recognition for each level they achieve in their commitment to best practices, supported all along the way by the campaign. The first tier—establishing which patients are veterans—sounds quite simple, yet, Palumbo says, it's crucial. Veterans' special needs may not have been met in the past simply because no one asked them whether they were veterans. "Two basic things everyone can do who works inside or outside of hospice are to ask patients whether they are veterans and to thank those who are for their service, and to do so genuinely." It's important, as well, she says, to determine in what era they served, as their participation in different wars may affect their end-of-life experiences. We Honor Veterans employs a military history checklist that identifies veterans, assesses the effect of their military service, and helps determine what benefits might be available to them and their families. In addition to demonstrating a commitment to this and other best practices, the VA has fostered a commitment among all involved to share everything it's learned about providing comprehensive care to veterans with community agencies as well as volunteers, including veteran volunteers. 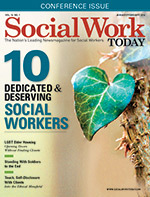 Playing a key part both in the delivery of services and coordination as well as in education are social workers. Each palliative care team, Palumbo says, is truly interdisciplinary, comprising a physician, nurse, chaplain, mental health provider, a clerical support assistant, and a social worker. The benefit of the VA's commitment to dying veterans goes beyond providing access to quality services. Equally important may be its staff of compassionate, empathetic individuals with whom veterans are likely to feel connected. "One of the values of the VA," Janssen says, "is that its staff understands the world of the armed forces—its culture, its codes of honor, its values and demands, what it's like to be part of a mutually protective team faced with a difficult and potentially fatal mission." These, he says, are things veterans aren't burdened by having to explain to outside professionals who may not comprehend their importance—things, he says, "related to establishing trust and safety, respecting boundaries and defenses, aspects of military culture and language that relate to action-oriented styles of coping, for example, or a familiarity with gripping metaphors often framed in the sometimes coarse language of military service." Janssen recalls, for example, working with a veteran who called the VA his base camp, his medical team his platoon, and his meds his heavy artillery. "It would be easy," Janssen says, "to make light of such metaphors, but they had a deep and visceral meaning to him, which was not lost on VA staff." This, he says, "helps build relationships of trust and contexts of safety." • the psychological cost of having participated in war, which may include guilt, shame, or a perceived need for forgiveness and understanding. As with any other patient, Palumbo says, "You have to understand the whole system of the person and who is in their support system. And for veterans, you have to understand how their military service affected their lives, whether they have PTSD, previous issues of loss, substance abuse, or diseases caused by their military experience." Furthermore, for some veterans there is a need to unburden themselves of unshared facts or feelings about their military experience or to have someone bear witness to the revelation of their experience. On the other hand, some may prefer not to share their feelings. 'It's a big issue," Palumbo says, "but it's an individual choice and we need to be respectful. You can ask questions, but you should not force someone to deal with an issue." Often, she adds, "if you give them a safe, nonjudgmental therapeutic place, they will open up." Some may want to participate in the Veterans History Project (www.loc.gov/vets), a project of the American Folklife Center of the Library of Congress that records and preserves veterans' stories. For those veterans who feel it's their role to be strong and to take care of their families, Palumbo says, "It can be hard when their bodies let them down. They don't want to acknowledge pain, and part of our role is to let them know they have a disease process and that we're here to give them good quality of life. We tell them they can have the will and the fight but sometimes bodies don't cooperate. We emphasize that it's their body that is failing, not them, and sometimes that relieves them." Some, she adds, will not want to transition to hospice, but that's another choice that must be honored. "Not all vets who reach the end of their lives will want hospice care," Janssen says. "Some may wish to undergo aggressive treatments with the intention of extending life even for a short time. The value of having palliative care teams in the VA is not to try to talk anyone into hospice care, but to make sure vets have the opportunity to have thoughtful and honest end-of-life conversations during which they can make informed choices based on their priorities, goals, and philosophies." Palumbo says, in light of the fact that only roughly one-half of America's hospitals offer palliative care, it's a remarkable achievement that the VA has been able to make hospice and palliative care available in all VA medical centers and through community resources so that it's a choice for every veteran. It's a clear gain for the nation's veterans, but social workers and other care providers benefit as well. "I have never been more grateful to work with a population than I am to work with our veterans," Palumbo says. "They are a population that is often stoic, yet kind, and also very appreciative of the care provided to them." For Palumbo and others in the field, it's not a job, but a calling. Through this work, she says, "I found what I was meant to do. I feel blessed to be allowed to be part of their journey through chronic illness, and it's a true honor to help guide them through such a difficult time in their lives and be of some help to them and their families. "As one of her doctor says, this is often our last opportunity to do what is right for those who gave so much." Ensuring excellent care for the growing number of aging baby boomers as they approach the end of life will require ongoing collaboration, growth, and vigilance. "These are the men and women who fought in Vietnam, and they are going to need our greatest commitment to stepping up our game and providing safe, loving, and trustworthy support with which to live the last chapters," Janssen says. "If the VA can continue to expand its focus on end-of-life care and enhancing patient choice, and if it can sustain a commitment to adequately staffing real interdisciplinary teams in which social work is a vital and respected player, I think veterans will be in very good hands," Janssen says.